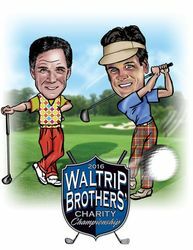 Last month's Eighth Annual Waltrip Brothers' Charity Championship (WBCC) raised nearly $600,000 to benefit multiple charities. Hosted by Darrell and Michael Waltrip in Franklin, Tenn., the Oct. 18 Champion's Dinner Presented by ACLJ.org and the Oct. 19 golf tournament sponsored by Speedway Motorsports, Inc. combined to raise more than $575,000, pushing the WBCC's fundraising grand total to well more than $3,000,000 over the last six years. Money raised this year benefitted Motor Racing Outreach (MRO), Speedway Children's Charities, The Journey Home Project, The Dog Knowledge Service Dog Foundation, Hope for the Warriors and Feed The Children. "Going into the WBCC every year, I always think we can't possibly top what we did the previous year, but every time, the entertainment is amazing, the guest list is stacked and the list of worthy causes we are able to help keeps growing," said Darrell Waltrip. "It has grown from a 'maybe I'll be there' to a 'can't-miss.' It's a fun event that does a lot of good, and I'm proud we can do that in Franklin." The Charlie Daniels Band headlined the dinner, which featured an opening performance by NewSong. FOX NASCAR host Shannon Spake and MRO President Billy Mauldin co-emceed the night's festivities. In attendance were FOX NFL host and Hall of Famer Terry Bradshaw, NASCAR owner Rick Hendrick, NASCAR drivers Denny Hamlin, Kyle Larson, Ricky Stenhouse Jr. and Kenny Habul. In a particularly poignant moment during the evening, two TDK Service Dog Foundation Inc. service dogs were awarded to deserving individuals to assist them in their daily lives. Service dog Henry was given to double-amputee and wounded veteran Chase Matthews, while Greer was given to the Jason Gusman family. Wounded veteran Jesse James Jackson and his family received an all-expenses-paid trip to Disney World. One-hundred forty-four of the dinner guests returned the next morning for the WBCC's "no mulligan" golf tournament at Vanderbilt Legends Club. "I say this every year, but the 2017 WBCC event was our best ever," said Michael Waltrip. "Great music, great golf and a lot of money raised for great causes near and dear to Darrell and my hearts. Charlie Daniels and NewSong were amazing. How do we top our event next year? We're already working on that and can't wait to see everyone next October in Franklin." Planning already is underway for the Ninth Annual Waltrip Brothers' Charity Championship in 2018, set for Oct. 17-18 at The Factory and the Vanderbilt Legends Club in Franklin. For further information, please visit www.waltripbrothers.com or contact Van Colley at vancolley@waltripbrothers.com.